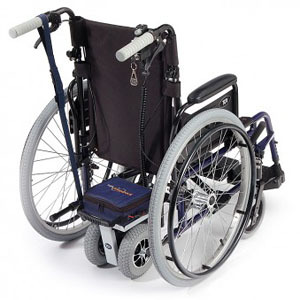 We have these great new wheelchair powerpacks available for hire. They have a battery powered motor unit & fit neatly into our foldable wheelchairs. They have proven to be very useful in taking the strain out of pushing up the steep Algarve hills. Attendant controlled with forward, reverse and speed controls. With twin wheel drive and great traction. It can be quickly removed and with the wheelchair folded can be easily transported. The hire cost including foldable wheelchair is from €60* per week.